Well, let's see. Since it's been sooooo long (before the earlier post today) I'll just write about the last couple of days! 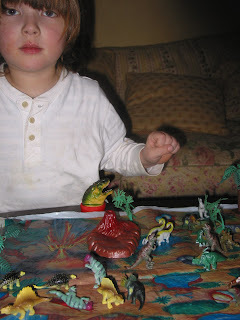 The day before yesterday we played with new dinosaurs that were supposed to be for Chirsmas, and had lots of fun with clay. We made a pleiseiosaurus, an octopus, a seafish, a seastar, a hermit crab, a frog, a paleontologist, and a few other things. 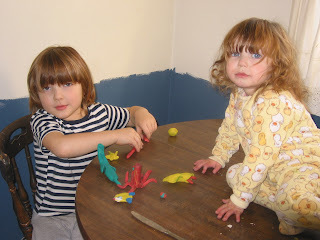 We made fossils, footprints, nests, etc. It was lots of fun. Trev loves it when I make figures for him. Trev also read a book, the 10th one in our set -something about The Plant.... I've forgotten what it's called. He's doing really well with that series, and I really, really, love it, too! It's real reading, and it's fun, also. He's happy about learning to read. Which of course makes me happy! Trev (of course) as been asking me "How may more days til Chiristmas!?" 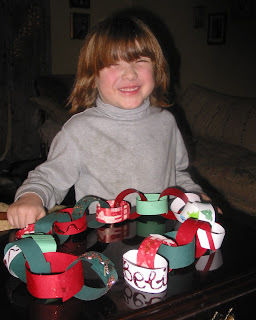 each day, so yesterday we finally made a paper chain, I had been telling him for several days that we would make one. We finally made it yesterday. Drug up some messy supplies from downstairs, and went to it! We decorated strips of paper with glitter, stars, doves, wrapping paper, markers, sequins, glue, and I have to say, the end result is beautiful! It is hanging next to our front door. 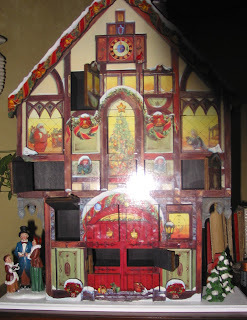 We have an advent calendar, I purchased a beautiful wooden one this year, and the children are thrilled to open it first thing each morning! If Maddie rises earlier than Trev, she takes me right in there to point up to it, and let me know she's ready to see what's in the new window. It's also the first thing Trev wants to do upon waking. There are two things in each window, of course, Initially I was thinking taking turns, but what fun is that? The cupboards are too small for anything large, but there is certainly enough room for more than one chocolate! Let's see, today while we were counting our remaining paper chain links, Trev -for the first time! remembered fifteen! He always skips from 14 to 16, and then is shady on it for a bit. He's been playing with a new math cd, it's called Math 1-2, and he's really enjoying it. I got it for future use, as it's for 6-8 year olds, but he does just fine with it, and is beginning to conceptualize numbers, I think. Maddie is getting more and more expressive. Yesterday when Trev was feeling blue she went to him to give him loves. She just hugged him and hugged him, and then kissed him. It was so sweet to see! Today we had a great day. We began it a little off-kilter, as we had places to go, therefore I was a bit harried, but after we got into the car, it was a super-fun day. 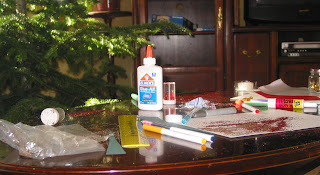 We had Art and Craft Circle this morning at eleven, we made sugar cube houses. Like Gingerbread houses, but with sugar cubes, of course. We lunched there, at Monica's, and made our house, though Trev just played, I planned to build the foundation, and have him help me decorate it. We didn't get it decorated, ran out of time, but I brought it home along with various candies, and hopefully we can complete it tomorrow. I'll post pictures of it when we get it done. After that we were planning on going to the mall to see Santa; I like to go to a specific one, because the last two years (at least) they've had this lovely man who sports his own beard, and I suspect he might be the real thing. Anyway, we were headed there, and our friend Ari heard us talking about it, and decided that they were coming, too! So they did. The mall also has a play area, and Trev, Ari, and Maddie got lots of leaping, climbing, and running done. Along with a couple of visits to Santa, which was just right across the hall. Trev said to Santa "Santa. We can't find Luke's X-Wing anywhere, so you gotta bring it to me for Christmas!" and Santa said he certainly would. And Trev reported that Maddie wants a kitchen. Santa told him his favorite cookies were Chocolate Chip, and to make sure to leave out eight carrots for the reindeer, and an apple for Rudolph, as that is his preferred treat. I am sure Trev will remember! I wanted to take my camera to the art circle today, but I forgot, and since we had friends following us to the mall, I couldn't stop at home to get it. But we'll be going back a few more times, I think, so I'll post pictures from next time.